The other day I blogged about my living room, and how we had opted for wooden and tiled floors throughout the ground floor of our house. We decided to go without carpets because when you live in the country and spend most of your time outdoors you encounter a lot of mud and this mud gets traipsed through your house A LOT. Due to the excessive amounts of mud and, lets face it, the excessive amount of rain we get here in England, a good old pair of wellington boots are essential footwear in the sticks. No one gives you a funny look if you're power walking up the high street or browsing the aisles in Waitrose whilst wearing them. Everyone has a pair. I have two! I love my trusty Hunters. They're almost ten years old now and have protected my feet on many a walk along windswept beaches and down muddy country lanes. I have recently added a gorgeous polka dot pair from Joules to the collection and these are my day-to-day pair that I wear when I'm doing the school run in the rain. Last year's freezing cold winter and the extra rainy spring of earlier this year didn't bother me in the slightest. I had my wellies.... Mud and puddles were no match for me! Welly socks kept my feet warm, chunky grips on the soles stopped me slipping in the snow and ice, and the fact my boots were knee high meant my legs and feet were kept perfectly dry. I wore them daily. 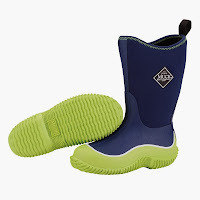 The girls also have their wellies and, like me, got a lot of wear out of them last year - but what I really want to get them this year is a couple of pairs of kids muck boots (available online from Jellyegg). Muck boots are a modern take on old fashioned wellies - 100% waterproof, of course, but also lightweight and flexible and only ankle height so easy for children to slip on and off quickly. The thing I like most about them is that they are insulated so keep little feet super cosy, plus the uppers are made from a stretch nylon that fits the legs closely to keep the warmth in and the cold and wet out! 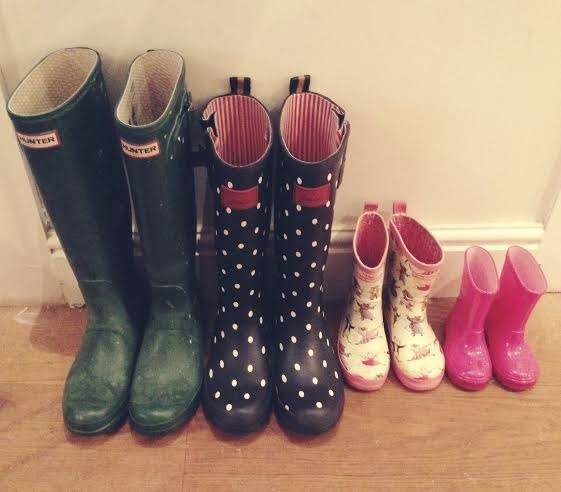 (That's my only problem with wellies for kids - they tend to be loose around the calf which lets the cold air in - and when there are deep puddles to splash in they can fill up with water). We all wear our boots so regularly that they're a part of our style now. I love a floral tea dress, chunky knit cardigan and wellies - and these muck boots would look adorable on the girls with some stripy tights, a cotton shirt and a denim pinafore! Swooooon! This post has been written in association with Jellyegg.